ATLANTA, GA – May 25, 2018 – Digital Projection International (DPI), A manufacturer of high-performance DLP™ projectors and fine-pitch LED video walls will present the highly talked about INSIGHT LASER 8K at the 2018 InfoComm show in Las Vegas June 6 – 8 (Booth C2018). DP’s 25,000-lumen INSIGHT LASER 8K projector, developed in collaboration with Delta Electronics, produces a remarkable & precise 33 million pixel resolution with deep black levels and a broad color gamut. Featured in a dedicated theater inside their booth, DP will provide show attendees the ability to screen the INSIGHT LASER 8K as it reveals true, uncompressed 8K imagery. The screening will also include a brief review of the advanced technologies that are employed in the INSIGHT LASER 8K. Digital Projection’s recent announcement that they had become a Delta Associate Company affirms the significance of the 8K’s development and future innovations. To demonstrate the unique capabilities of the INSIGHT LASER 8K, DP has partnered with ASTRO & Analog Way. The combination of technologies enables a range of applications & functionality that no other projection solution can support. 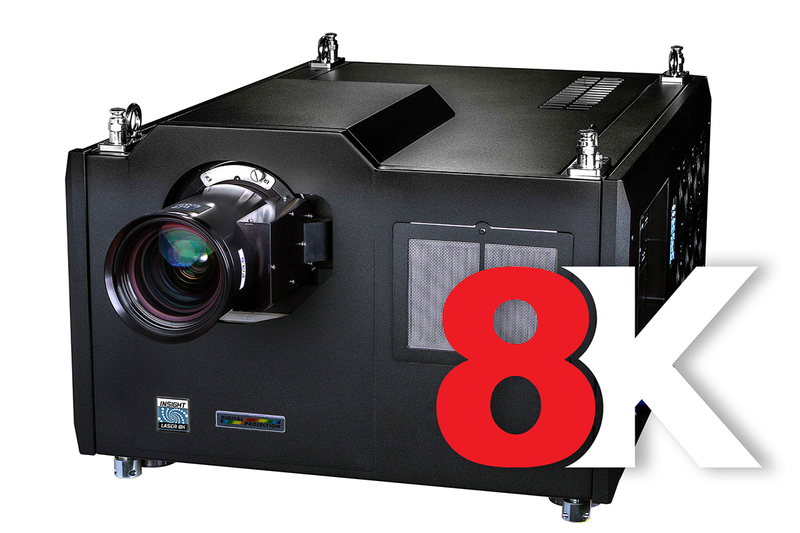 A capable selection of fixed and zoom lenses, providing extensive lens shift, ensures integrators installing the INSIGHT LASER 8K will have complete flexibility with respect to projector placement. Also on display at InfoComm will be Digital Projection’s innovative 4K laser projectors, new single-chip DLP projectors with direct red lasers and the ultra-bright, fine-pitch, Radiance LED video walls. Attendee capacity for the INSIGHT LASER 8K presentations is limited. Reserved tickets must be picked up at the reception desk in Digital Projection’s booth (C2018) at least ONE HOUR PRIOR to the chosen presentation time. Founded in 1989, Digital Projection International (Digital Projection) has been instrumental in the development and application of Digital Light Processing™ technology by Texas Instruments for projection systems. Digital Projection International introduced the world’s first 3-chip DLP® projector in 1997 and has since delivered expert system engineering and world-class customer services, thus maintaining its position as a digital imaging pioneer. Digital Projection International’s groundbreaking projection research and development has garnered the admiration of industry professionals around the world. This recognition has earned the company many awards, including two Emmy® Awards for Outstanding Achievement in Engineering Development by the Academy of Television Arts and Sciences. Digital Projection remains the first and only projector manufacturer to win the coveted award. Today, Digital Projection International manufactures & distributes an extensive line of ultra-high-performance 3-chip & single-chip DLP® projectors, along with Radiance LED – direct-view, fine-pitch LED displays. These elite products are the reference standard for demanding applications including: large-venues, live-event staging, fortune 5000, education, medical & scientific research, command & control, digital cinema, commercial entertainment, digital signage, worship and elite home cinema. For further information and product photos, please visit www.digitalprojection.com. Delta, founded in 1971, is a global leader in power and thermal management solutions and a major player in several product segments such as industrial automation, displays, and networking. Its mission statement, “To provide innovative, clean and energy-efficient solutions for a better tomorrow,” focuses on addressing key environmental issues such as global climate change. As an energy-saving solutions provider with core competencies in power electronics and innovative research and development, Delta's business domains include Power Electronics, Automation, and Infrastructure. Delta has 163 sales offices, 64 R&D centers and 39 manufacturing facilities worldwide. Throughout its history, Delta has received many global awards and recognition for its business achievements, innovative technologies and dedication to corporate social responsibility. Since 2011, Delta has been selected as a member of the Dow Jones Sustainability™ World Index (DJSI World) for 7 consecutive years. In 2016, Delta was selected out of 5,800 large companies by CDP (formerly the Carbon Disclosure Project) for its Climate Change Leadership Level.